Let’s cut to the chase. The Golden State Warriors are going to win the 2016-17 NBA title. About the only drama left in this year’s postseason is whether or not these Super Warriors will drop a game on their way to their second championship in three years. Sorry, LeBron. Your reign as King of The Land is over. Time to hand over the crown to the boys from Bay. The Warriors flashed their greatness in Game 1 of the Western Conference finals against the San Antonio Spurs. After a long layoff and missing their head coach, Steve Kerr, the Warriors got out of the games slow. They were sloppy. They were rusty. And they fell behind by 25 points. Yet, they won thanks to 40 points from Steph Curry and 34 from Kevin Durant. After being held to 42 points in the first half, the Warriors exploded like a ballistic missile in the second half and finished with 113 points. A truly remarkable turnaround that should scare and discourage the remaining playoff teams. 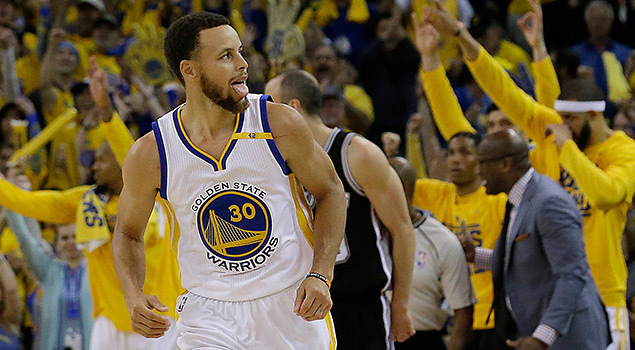 The Warriors played their C game and still won, remaining perfect in the postseason. They clearly have their sights set on the 2001 L.A. Lakers’ 15-1 playoff record. Notice Curry kept saying “little.” The Spurs made a “nice little run” to take advantage of the Dubs, who were coming off their “little break.” San Antonio, despite a near-perfect half, never had a chance. Curry and Co. are a confident bunch. And they should be. Once they found their groove it was lights out. With a healthy Kawhi Leonard, the Spurs have “little” chance to win beat the Dubs. With Kawhi hobbled by a bum ankle, the Spurs have no shot. It shouldn’t come as a surprise, though. The Warriors should have started getting fitted with their championship rings last summer when Kevin Durant decided to leave his Thunder buddy, Russell Westbrook, and join the team that won a record 73 games. It’s like Batman joining the Avengers. You’re talking about an MVP in KD joining a squad that already boasts a two-time MVP in Curry. Both at the height of their powers. Then you add two more studs in Klay Thompson and Draymond Green — both arguably among the top 15 players in the NBA — and you basically have the greatest collection of talent in the basketball universe. It is almost unfair. A competitive advantage no team has enjoyed throughout history. With Curry and Thompson, the Warriors have the two best shooters in basketball history. Add Durant — a multiple scoring champ — to the mix and you have an unguardable unit. You won’t find a better offensive unit. Oh, by the way. The Warriors are also armed with two elite defenders in Draymond and Andre Iguodala. Yikes! If LeBron James can win two games against these Dubs, he should get a statue at every NBA arena. These Warriors are insanely good. When the final confetti drops at Oracle Arena after the Dubs are crowned NBA champs, we’ll be comparing them to the all-time great teams. These Warriors are no longer just chasing down a championship. They’re chasing down history.